Well it seems that I am always making soup on a Sunday and blogging about it! This week it was French Onion Soup as I just had a fancy for it. I'm not going to post the recipe, you can see it on the BBC Good Food website here if you fancy making some. I'm not sure it is the best recipe I've used but it did the job. I know it looks better with a big bit of baguette and cheese on the top, but as I'm trying to cut back on the cheese, we had it without. Oh I love French Onion Soup.... but I might (ahem) have had the baguette and cheese... looks delicious by itself, mind you! My mouth is watering at that picture, Janice. 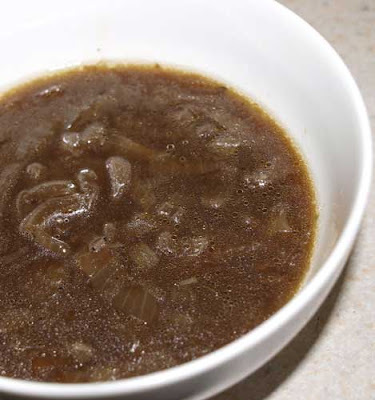 I've made the English Onion soup from the good food website, which I thought was lovely, but I'll give this one a try too. I'm with Wendy on the cheesy toast mmmmm! I am now craving for some soup since it is cold outside! I like it! Thanks for sharing! Homemade Freench Onion Soup is the best! I love onion soup any old way. You have some great recipes. 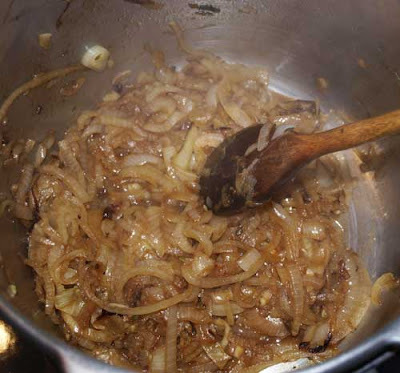 It is so cold at the moment we could all do with a delicious bowl of onion soup. Sunday soup day then what about other weekdays??? Anyway fabulous french onion soup. Ya even i am also with the same problem . What about other days ? :P Your heading is really grate. I think this very delicious dish.